Jacket with attached vest and shirt, hat, sash, boot tops. Size: STANDARD (fits up to 44 jacket size), XLARGE (fits 44-46 jacket size). Recent movies and TV series make this elegant, historically accurate, attire very attractive and popular. 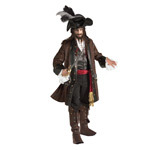 Elegant XVIII century, historically accurate, pirate costume. Worn by upper class soldiers of fortune, based in the Caribbean. One of our better pirate costumes.